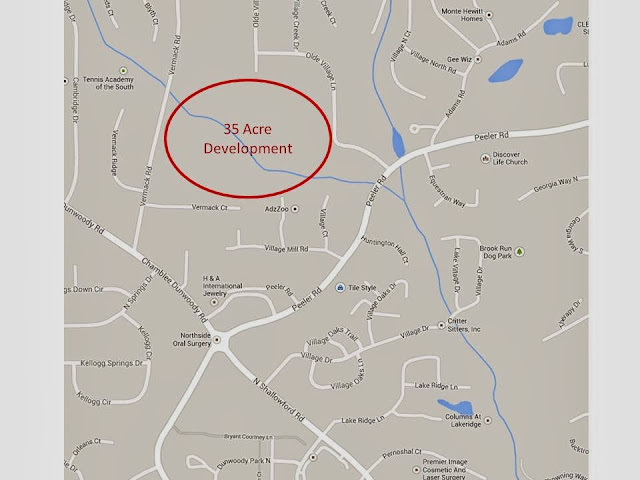 In regards to the proposed development of 52 homes in "The Desert" off of Vermack, I've sent repeated emails to individuals associated with Save Dunwoody over the past several weeks and have received no response. Regardless of your stance on the project, why not have a conversation? Or maybe they're still upset with me because (per their claim on their website) I single-handedly caused two candidate forums to be cancelled this past election cycle??? I sent a message to this email address on December 22nd and have not had a reply. I am offering a second chance for a response. I have added some others into this message for distribution. Can you please schedule a Public Meeting of Save Dunwoody to discuss the largest single family home development activity since the city has been incorporated? Which members of “Save Dunwoody” are authorized to declare this an issue that the organization will take up? What are your criterion for taking up actions? Is there a vote? Your website does not provide names of officers, leaders, or specific individuals to contact. Yet there seems to be an organization. There must have been individuals that decided which items to coalesce around. People decide what to put on the website and on yard signs. Save Dunwoody took on the issue of the trail in Brook Run park, citing “Saving” 337 trees. I estimate that 4,500 trees may be destroyed in this development. The city has a no net-loss of tree policy, but it only applies to city-owned property. For Single-Family Homes Zoned R-100, the minimum lot area is 15,000 Sq. Feet. Which means leaving or planting 2 trees per lot. Over the proposed 52 lots, that means 104 trees will be planted or “saved”. 7/10 mile long & 30-ft wide area = 110,880 Sq. Ft.
Chapter 16 - LAND DEVELOPMENT >> ARTICLE II. - ENVIRONMENTAL CONTROL >> DIVISION 5. TREE PROTECTION Sec. 16-184. Applicability. “. any activity on real property which requires the issuance of a development permit or a substantial building permit within the city, but excluding the construction of individual single-family detached and duplex dwellings. Chapter 16 - LAND DEVELOPMENT >> ARTICLE II. - ENVIRONMENTAL CONTROL >> DIVISION 5. TREE PROTECTION Sec. 16-195. Tree preservation. What is the Downstream neighbor effect? Our friends in Village Oaks are downstream of this development, as the stream flows across Peeler, into Brook Run Park beyond? Less road maintenance, storm water, police services, etc. What will be required? What is the impact? Is it a net positive or negative on city services, infrastructure, parks, etc.? What is the net effect of traffic on Vermack as a result of this? Please hold a meeting of Save Dunwoody and let the people decide if this issue is to be taken up. I find it interesting that you, Mr. "Don't ask, don't tell", feel it necessary to call on Save Dunwoody when the issue affects YOU! Was it not you that used the terms "NIMBY" and "CAVES" when discussing the SD position on bike lanes, the roundabout, DV Parkway, etc. Your previous high and mighty attitudes was not well received and just shows how ignorant you really are regarding the issues of the overbearing Council and City Manager. Why should anyone who has been the target of your past selfish rants really give a damn about your problems? Spit on them now and you will not be able to count on them in the future! Just sayin'.